S&P 500 is Holding up to avoid a Short Term Sell Signal. 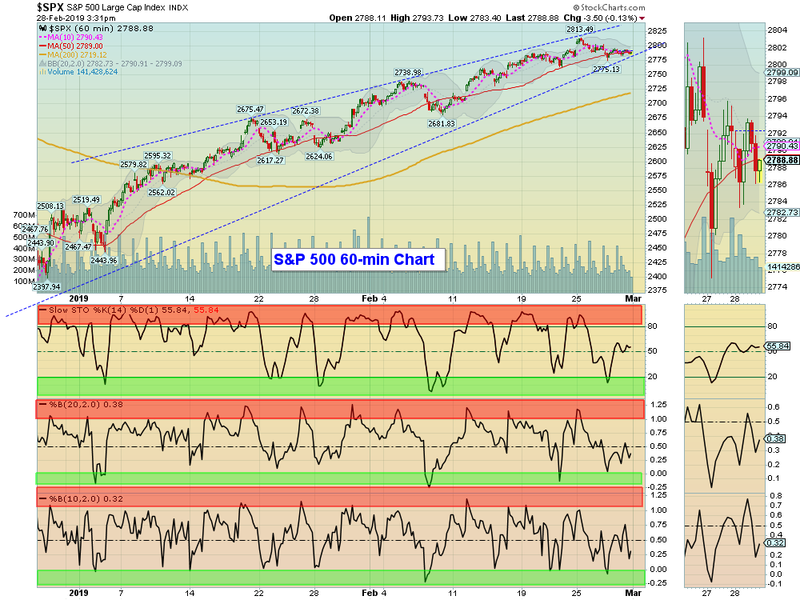 Markets were down slightly today and the S&P 500 needs to bounce up from the Pink Line (10-day avg.) of 2782 to avoid a Short Term Sell Signal. 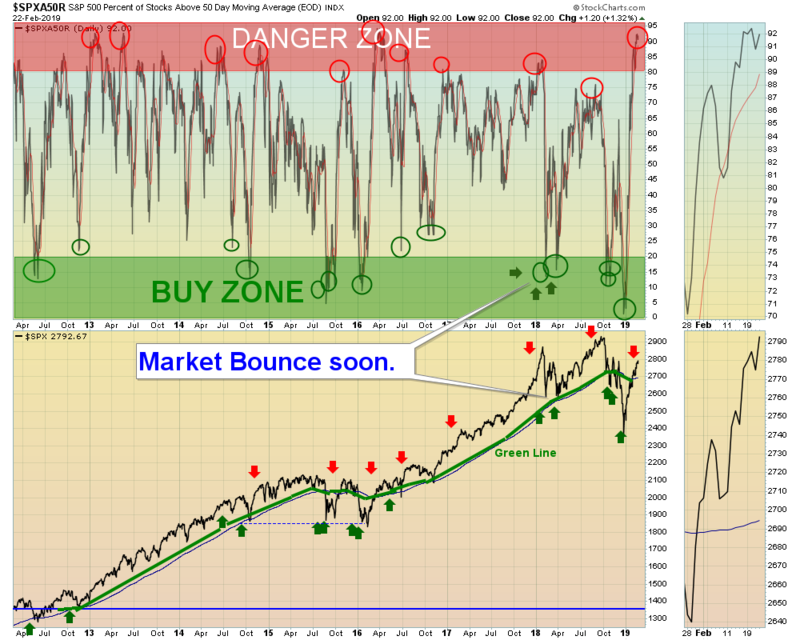 Maybe another bounce coming tomorrow. Markets are over-bought again, as many Leaders were back up in the Red Zones (probably too late to Buy for the Short Term). Crude Oil was up $0.30 today at $57.30. AVGO BROADCOM, INC. Money Wave Buy today. AVGO will not be logged as the Volume is below average. MTCH MATCH GROUP Money Wave Buy today. AVGO will not be logged as the Volume is below average. AU ANGLOGOLD LTD. Money Wave must Close in the Green Zone. GDX GOLD MINING FUND Money Wave must Close in the Green Zone. CHANGE PBR PETROBRAS ENERGY to Medium Term ( Sell if it is going to Close below the Red Line of $15.53). LOWER CROX CROCS, INC. Sell Stop Loss to today’s Low of $24.77. Try to Sell around $28.50. EXIT EIDO INDONESIA FUND if it is going to Close below Support of $25.72. This trade was not logged. EXIT EXAS EXACT SCIENCES if it is going to Close below your Buy Price, or $92.04. This trade was not logged. S&P 500 needs to bounce up off the Pink Line to avoid a Short Term Sell Signal. Markets were down today and the S&P 500 needs to bounce up from the Pink Line (10-day avg.) of 2778 to avoid a Short Term Sell Signal. Markets were over-bought again, as many Leaders were back up in the Red Zones (probably too late to Buy for the Short Term). Crude Oil was up $1.55 today at $57.05. PBR PETROBRAS ENERGY Money Wave Buy today. Target is $19.00. EXIT if it is going to Close below the recent Support of $16.15. MTCH MATCH GROUP Money Wave must Close in the Green Zone. 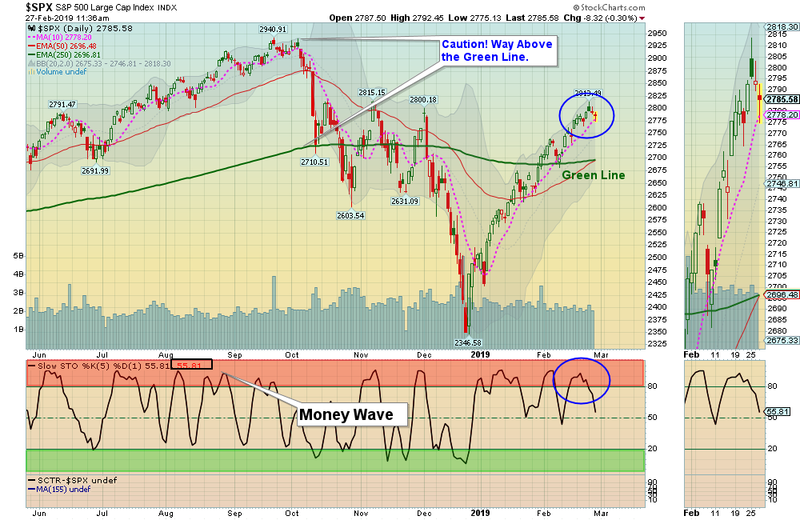 TNDM TANDEM DIABETICS Money Wave must Close in the Green Zone. EXIT SBUX STARBUCKS CORP. if it is going to Close below the Pink Line around $70.72. EXIT IAU GOLD FUND if it is going to Close below the Pink Line around $12.69. This trade was not logged. StarBucks is Way Above the Green Line. Markets were up slightly today as the Markets are about 1/2 way back up to yesterday’s High. Volume is low as Buyers don’t have much News to react to, and Sellers don’t have a reason to exit. Markets are over-bought again, as many Leaders are back up in the Red Zones (probably too late to Buy for the Short Term). Crude Oil was up $0.20 today at $55.70. CGC CANOPY GROWTH Money Wave Buy today. CGC will not be logged as it is already up 5% today. 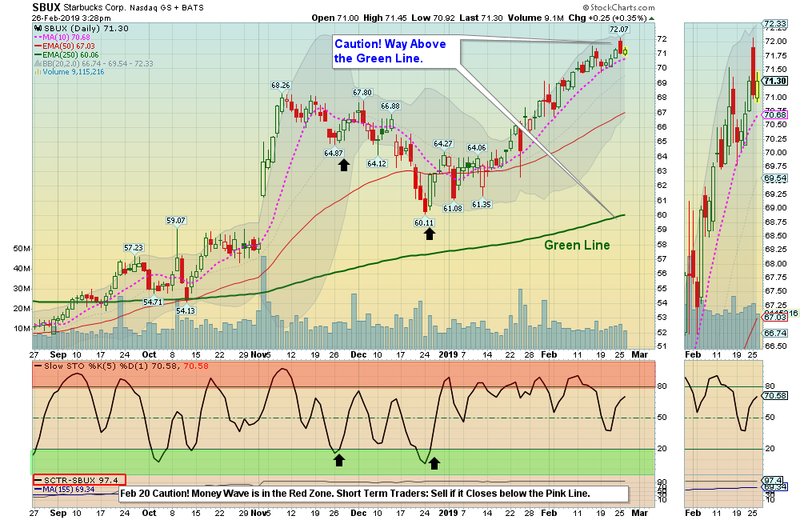 AVGO BROADCOM, INC. Money Wave must Close in the Green Zone. EXIT DG DOLLAR GENERAL if it is going to Close below the Pink Line around $118.67. This trade was not logged. Markets Gapped Up on Emotional Buying this morning. Markets “Gapped Up” today on more Good News Buying of a possible China Trade Deal soon. Sellers are holding off. Crude Oil was down $1.80 today at $55.45. SAVE SPIRIT AIRLINES Monet Wave must Close in the Green Zone. EXIT IAU GOLD FUND if it is going to Close below the Pink Line around $12.66. This trade was not logged. EXIT PBR PETROBRAS ENERGY if it is going to Close below the Pink Line around $16.42. This trade was not logged. Market have quickly gone from Over-Sold to Over-Bought in 2 months. 02/24/2019: Markets were up again as more Good Earnings poured from last quarter. Markets have quickly gone from extremely Over-Sold in Dec. to extremely Over-Bought now (see Chart above). Investor Fear is now back to Investor Greed, and many Leaders are Way Above the Green Line again (all Investments eventually meet again with their Green Lines). For the week the Dow was up 0.57%, the S&P 500 was up 0.64%, and the Nasdaq 100 was up 0.50%. The very Long Term Trend on the Stock Markets is UP. All of the major US Indices are back Above the Green Lines. The Inflation Index (CRB) was up 1.51% and is Below the Green Line, indicating Economic Weakness. Bonds were down 0.34% for the week and are Above the Green Line, indicating Economic Weakness. The US DOLLAR was down 0.27%, but is over-bought again. Crude Oil was up 2.29% for the week at $57.26, and GOLD was up 0.81% at $1333. We are currently in 4 logged Open Positions, for the Short & Medium Term. There are 2 Investments on the Short Term Watch List. ACAD ARCADIA PHARMA Buy if it Closes above $23.55 on heavy Volume. AVP AVON PRODUCTS Closed above $2.99 with a 22% gain. 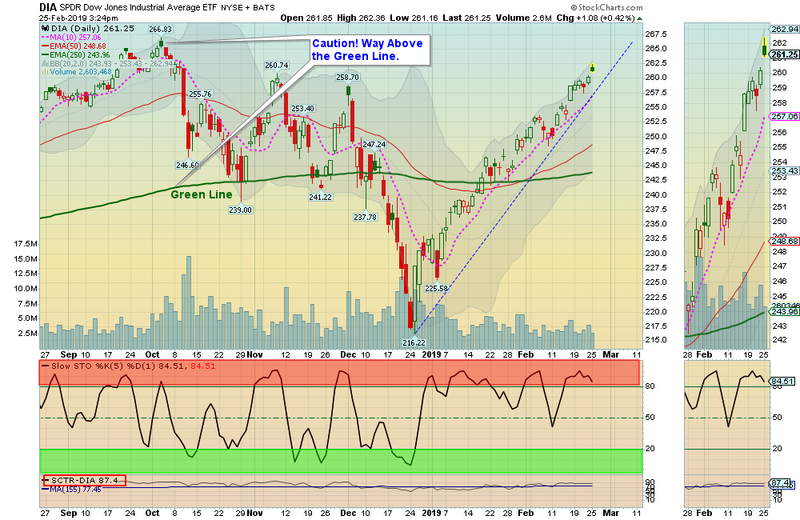 Wait for the next Daily Money Wave Buy Signal. FIT FITBIT, INC. Buy if it Closes above $7.79. LW LAMB WESTON HOLDINGS Buy if it Closes above $71.57. ODP OFFICE DEPOT Buy if it Closes above $3.60. Emailed to your box between 3:30 – 3:50pm EDT. Twitter notifications @AboveGreenLine (Fastest and most reliable).